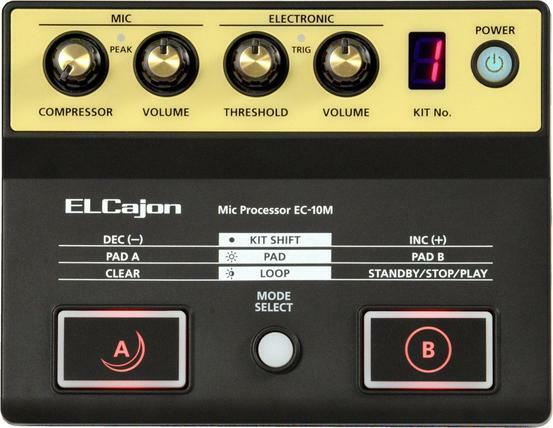 The EC-10M ELCajon Mic Processor is a unique and innovative creative instrument designed for the acoustic cajon. It reinforces and amplifies your cajon sound so that your performance can always be heard, whether you’re playing in small bars or on large stages. You can also perform with additional sounds such as tambourine, shaker, djembe, and electronic drums. Adding an EC-10M to your set-up turns a standard acoustic cajon into an instrument that can cover a world of percussion. In addition to a standard acoustic cajon, you can also use the EC-10M with various other instruments by simply attaching the dedicated clip-on mic, such as mini cajon, an acoustic guitar or even a cardboard box. The acoustic cajon playing experience is reinvented and extended with the EC-10M ELCajon Mic Processor. With the EC-10M, it’s easy to take your acoustic cajon performances to new heights. Just attach the dedicated clip-on mic to the cajon’s sound hole, and then layer the EC-10M tones with the acoustic sound to create unique hybrid sounds. The 16 kits include percussion sounds like tambourine, surdo, splash cymbal, and many others, plus acoustic snare drum and the famous Roland TR-808 snare. Built-in acoustic cajon tones with extra ambience are also included for reinforcing your acoustic cajon’s natural voice with a powerful studio sound. You can use the compact EC-10M anywhere, since it weighs just 500 g/1.1 lbs. and runs on four AAA batteries. The included clip-on condenser mic is compact and convenient, eliminating the need to take up valuable stage space with a mic stand and large microphone. Thanks to its small footprint, the EC-10M can fit into even the tightest performing spaces. The EC-10M applies a distinct instrument sound to the center of an acoustic cajon’s playing plate, while another separate sound is applied to the top edge. Each of the EC-10M’s 16 preset kits include two electronic sounds that are pre-assigned to the onboard A/B foot pads, for triggering with toe taps while performing. If you’d prefer to play these sounds with authentic foot techniques and a more solid feel, up to two Roland kick-trigger pedals (KT-10, KT-9, or KD-7) can be connected allowing you to trigger cowbell, foot splash or even four-on-the-floor kick drum patterns. The EC-10M includes a built-in looper* for the on-board electronic layered sounds. This lets you create instant percussive loops and phrases, freeing you up to play the acoustic cajon over the top. The looper is controlled using the A/B foot pads making it easy to control while you play. Any electronic sounds triggered from the cajon and external pedals can be included in your loops. If you change the preset kit sound while the loop is playing, the tones in the loop are changed too. Acoustic cajon performances can be transformed, once you start to incorporate loops into your set. The EC-10M can be used with a mini cajon or even a cardboard box—in fact, anything that the clip-on mic will attach to. Regardless of the size of the instrument you play, the sound can be transformed into a percussion sound by using the EC-10M. The body of an acoustic guitar can also be used with the EC-10M by attaching the clip-on mic onto the sound hole of the guitar. The possibilities are limitless. Learn more by watching our quick start video.